I had this on my want list for a while, but the negative comments about the components and the fact that I had another Face2Face game with bad components made me drop it. In reality, I didn't find the colors confusing (the horses or the board), but I did find everything just a bit too small: the horses were cramped on the spaces, and the betting tokens were too tiny. But in the end, it didn't matter because the game fell flat for everyone: too random, too much chaos, too much downtime. Afterwards, we discussed Extreme Winner's Circle. [This game group designed Extreme Can't Stop which uses simultaneous die rolling and some slightly modified rules for getting to the top, and plays very quickly.] In some fashion, EWC would allow all players to choose a horse simultaneously based on a single die roll. This could potentially mitigate all of the bad things about the game. The first time for 3 of the 5 players. Despite my aggressive bidding for Harbor Master, I only managed to win it twice, and came in 3rd. The Pirates failed to board or plunder a single punt the entire game, which lasted a mere 6 rounds. Jade took off early. I overbid for the HM just to make sure Jade was not included for a round so I could catch up (I was trying to corner the market in Ginger). Alas, I couldn't get Ginger into the harbor. The final share prices were: 30, 10, 5, 5, 5! My first time playing on the real board (I still haven't played my copy). It's strange to try to implement all the mechanics of a game when you are used to the computer doing it for you. On the real board, the laying out of the province cards and free items is a little awkward. There isn't really enough space for everything without covering some information. 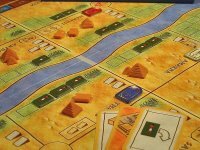 I've never won a game of Amun-Re, and tonight was no exception. I got 2 bonus cards that I thought I could fulfill during the Old Kingdom, so I went all out to do so. I also managed to get a set of 3 pyramids built, giving me 12 VP after round 3, leaving me with only 9 gold going into the New Kingdom. All the other players had more than 20. This proved fatal. They were able to outbid me and buy lots of good stuff. 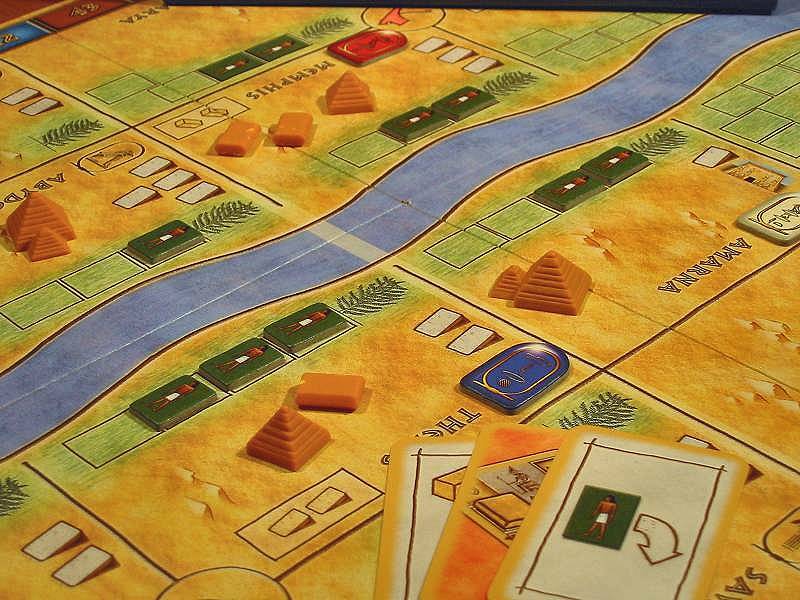 I ended up with only one set of pyramids, 1 temple (at 4), 2nd place in money, and 1 bonus card (9 farmers), for 17 VP. My final score was 29 VP which tied for last. The winner had something like 45. I love this game. Looks like we are on for an all-day session this coming Saturday. Woohoo! Sorry to hear you didn't enjoy Winner's Circle. Our version (Royal Turf) is a big favorite in our family. I've even made additional betting chits, to accommodate more simultaneous players.